Maybe the GOP's vice-presidential pick has a plan for the well-off, but what about everyone else? Republicans and Democrats tend to go about the business of building presidential tickets in different ways. Ever since John Kennedy, Democrats have had a weakness for dashing younger men like Bill Clinton and Barack Obama and, I suppose, Jimmy Carter. They balance their tickets with senior statesmen--Lyndon Johnson, Joe Biden, Walter Mondale. (Al Gore was young but played ancient.) Republicans do the opposite: with the exception of Bush-Cheney, they select a senior statesman as their presidential candidate and a dynamic, young and often ideological type for No. 2. Richard Nixon was a ripe old 39 when Dwight Eisenhower chose him, Dan Quayle was 41, Sarah Palin was 44--and now Paul Ryan, 42, is the perfect picture of a traditional Republican Vice President. But there is something radically different about the Ryan pick, something I've never seen before. This presidential campaign is now, substantively, all about him. That was sort of true of Palin, but her disastrous insubstantiality, not her beliefs, was the issue. This time, the maddeningly vague Mitt Romney has effectively outsourced his job as intellectual leader of the ticket to his occasionally specific junior partner. Romney seems to have mixed feelings about that, flipping another flop on the Ryan budget, which he once called "marvelous" and now has walked away from, saying he's going to come up with a budget of his own one of these days. Romney also had a fair amount of trouble describing his view of Ryan's plan to voucherize Medicare. The Ryan pick may have energized the Republican base, but Romney remains the same old awkward, evasive Romney. And so we seem to be headed for a campaign of ideas--Ryan's ideas--and that may or may not be a good thing. Yes, it's important to have a ground-zero discussion about the sort and size of government we want to have. The trouble with Ryan's deep thinking on so many of these issues, though, is that it's not very deep at all. He lives in a libertarian Disneyland where freedom is never abused, where the government is an alien entity whose only function is to flummox the creative intelligence of übermensches like Ayn Rand's hero, the architect Howard Roark. It is remarkable and, frankly, a bit terrifying that this puerile vision has become the operating philosophy of the Republican Party. 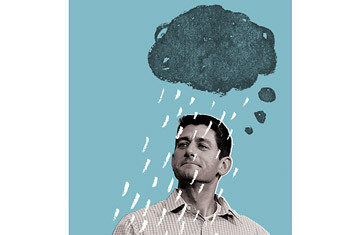 Worse, some of Ryan's most important ideas have been tried and proved failures. Ryan has produced various plans, proposals and two actual federal budgets, and they all have one thing in common: they cut taxes drastically. In his 2011 budget, which he sent to the Congressional Budget Office for scoring, he estimated that despite the drastic cut in rates, the revenue would remain the same as a percentage of gross domestic product. This is supply-side economics, the utterly uncorroborated theory that the less people pay in taxes, the more they'll produce. Ryan's mentor Jack Kemp sold Ronald Reagan on it in 1980. The result was such a huge hole in the federal deficit that in 1982, Reagan was forced to come back with one of the largest proportional tax increases in American history. Supply-side tax cuts didn't work for George W. Bush either. By contrast, Clinton raised taxes and the economy boomed. Who knew?